Concerned Christians of the Western Cape leaders at a press conference in Cape Town on Monday. They are, from the left, Marlon Petersen, Rev Barry Isaacs, Evariste Umba and Gerald Siljeur. A group of Western Cape Christian leaders this week issued a biblically-based call for justice to be served peacefully for people who have been historically robbed of their property. Explaining the response of the Concerned Clergy Western Cape (CCWC) to parliament’s decision to amend Section 25 of the Constitution to allow expropriation of land without compensation, CCWC chairperson Rev Barry Isaacs referred to Nehemiah 5: 6 -7 which speaks of an outcry and anger over the unjust loss of land. “Right now there is an outcry for land and homes, people are angry — and if government does not do justice to this, this bubble will burst,” he said. Isaacs, who has personally been seeking to resolve a family land claim for about 20 years, said there are quite a number of claims in the Western Cape that have been dragging for a long time. The situation was bringing division into families and the delayed justice was playing into the hands of political groups that advocated land grabs and violence, he said. He believed that in cases where land had been taken illegally or under duress, victims should get their property back or be financially compensated according to the current value of the property. 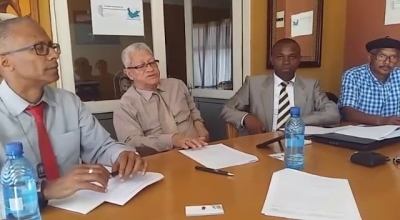 In a press statement released at a meeting at Reconciliation Ministries in Steenberg, Cape Town on Monday, the CCWC called for a process of interest-based mediation involving specially-trained land mediators, and for the immediate establishment of a land invasion unit to prevent unlawful land invasion and protect people and property. Isaacs said the CCWC, which had proposed a mediation process in its submission to government on the land question in June, was encouraged by a recent announcement by President Cyril Ramaphosa that he had appointed land mediators. The CCWC was checking on the credentials of the mediators. It was concerned that they should not be politicians. He said politically-driven land grabs in the Western Cape, especially in the Macassar area, were creating problems for municipalities, and there was a need for a land invasion unit — probably headed by SAPS — similar to the special Anti Gang Unit that had been created to deal with gangsterism in the Western Cape. The CCWC was established nearly two years ago in response to community violence and was committed to dealing with matters of injustice and unrighteousness, said Isaacs. Regarding land injustice, its position was biblically-based, with key scriptures being Nehemiah 5: 6-7, 11 (Nehemiah’s position concerning the robbing of the poor of their land/property, crops and money), Luke 19: 1-9 (Zaccheus on restoring what was illegally taken), and Proverbs 3: 27; 22: 22-23. 2. Grant properties/Land to ANY government officials. 3. Allow government officials who issued illegally title deeds of property that belongs to the victims of Group Areas Act to operate until further investigations. 1. Focus on the poor, legitimate land claimants and the victims of past discrimination as beneficiaries. 2. Expropriate without compensation Property inherited illegally from the apartheid era and townships land overpriced in the market during governmental process of development. 5. Should the state be found to be a guilty party, it has to make restitution to the owner immediately The poor has been robbed, and as the CCWC we call on all our credible leaders to take a justifiable stand. Does God have anything to say about land?